FILE - British politicians (L-R) John Whittingdale, Theresa Villiers, Michael Gove, Chris Grayling, Iain Duncan Smith and Priti Patel pose for a photograph at the launch of the Vote Leave campaign, at the group's headquarters in central London, Feb. 20, 2016. In the run-up to Britain’s referendum on whether to remain in the European Union, opponents of Brexit warned that leaving the bloc would lead to economic peril, but the country’s economy appears to have performed strongly in the 78 days since the vote, undermining predictions of gloom and doom. And now, leading Brexiters are calling more loudly for a quick, sharp break with the EU — or a “hard Brexit.” They point to the buoyant stock market and strong figures for jobs and retail sales as evidence the government should not delay invoking Article 50, the treaty clause that would start a two-year countdown for Britain’s formal exit. 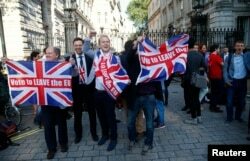 FILE - Vote Leave supporters wave Union flags, following the result of the EU referendum, outside Downing Street in London, Britain June 24, 2016. May has sought to keep at bay questions about how Britain will exit the troubled bloc, and what the country’s future relationship will be with the EU, by repeating the mantra “Brexit means Brexit.” But that slogan doesn’t even begin to answer fundamental questions thrown up by the June referendum. Some Brexiters want a total break; others — along with many in the Remain camp — hope Britain can negotiate a deal along the lines of Norway and remain a member of the Single Market, enjoying free trade with EU members. And some Remainers are still holding out hope that when push comes to shove Britain won't in the end leave. 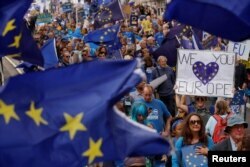 Pro-Europe demonstrators protest during a "March for Europe" against the Brexit vote result earlier in the year, in London, Sept. 3, 2016. They are placing their hopes on High Court challenges to the referendum due to be heard next month, or they argue a change of government before the exit period is complete could lead to a reversal. But with the main opposition party, Labor, continuing to implode, the latter would seem unlikely - and the judicial challenges are a long shot, say legal experts. Brexiters like Duncan Smith worry that the longer May delays on starting the exit process the more chance a closer relationship with the bloc than he wants will be the result. Privately, in conversation with VOA, several leading Brexiters in the government say they fear May and her closest allies will shape a deal with the EU that would see Britain remain in the Single Market, but having to accept freedom of movement, meaning Britain won’t be able to impose migration controls on Europeans living an working in Britain. Securing access to the Single Market would also almost certainly entail Britain continuing to make large financial contributions to the EU budget. 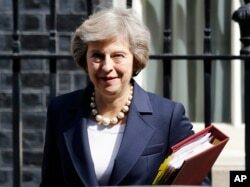 May, who campaigned during the referendum for Britain to remain in the EU, is walking a political tightrope. She risks revolt by Brexiters inside her party who want to ensure the country breaks completely from the EU if it appears she is moving behind-the-scenes to shape a deal that would see Britain cleaving closely to the EU. But at the same time she is coming under strong pressure from Britain’s non-EU trading partners to negotiate a deal that would see Britain retaining access to the Single Market. Japan’s Foreign Ministry took the unusual step during last weekend’s G-20 meeting of the leaders of the world’s most advanced economies of publishing a paper on the consequences of Brexit. The paper urged Britain to retain full access to the Single Market and allow British employers to hire freely EU nationals. Japanese firms are major employers in Britain and half of all Japanese investments to the EU are directed to Britain. The Japanese aren’t the only ones worried about what a hard Brexit would mean for their investments and businesses. American bankers have already drawn up plans to reallocate staff from London to Dublin, Amsterdam, Paris or Frankfurt in the event of a stark break. Hardline Brexiters pooh-pooh all the warnings, arguing the "Brexit boom" shows the strength of the British economy and how it will do well outside the EU. 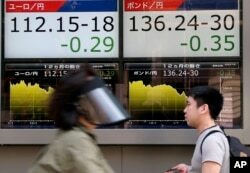 FILE - People walk by an electronic board displays exchange rate of euro, left, and British pound at the securities firm in Tokyo, Monday, June 27, 2016. But according to many economists it would be wrong to bank too much on the apparent boom. They say the economic consequences of Brexit remain unclear because Brexit hasn’t actually happened yet. But they warn the longer-term signs are not good. Rupert Pennant-Rea, a former deputy governor of the Bank of England, says the “strongest clue” of what Brexit might mean for Britain comes from the currency markets. “The message has been consistent and its implications have still to sink in,” he argued in an opinion article written for Britain’s Financial Times. Senior Conservative and onetime government minister John Whittingdale rejects talk of economic peril, arguing naysayers about Britain’s post-Brexit prospects are looking for evidence of an economic meltdown. In an interview with Britain’s Sunday Telegraph he argued the country’s prime minister must trigger the start of Britain’s formal withdrawal from the EU within weeks and he criticized May openly for delaying, warning that it leaves the door open for Remain campaigners to try to stop Brexit. “Until you embark on the formal process there will be some who will continue to suggest that somehow this can be fudged, that we can make some changes but still essentially remain a part of it and will attempt to find a way out,” he warned.